The skyline of London is a stunning mixture of old and new, traditional and contemporary. 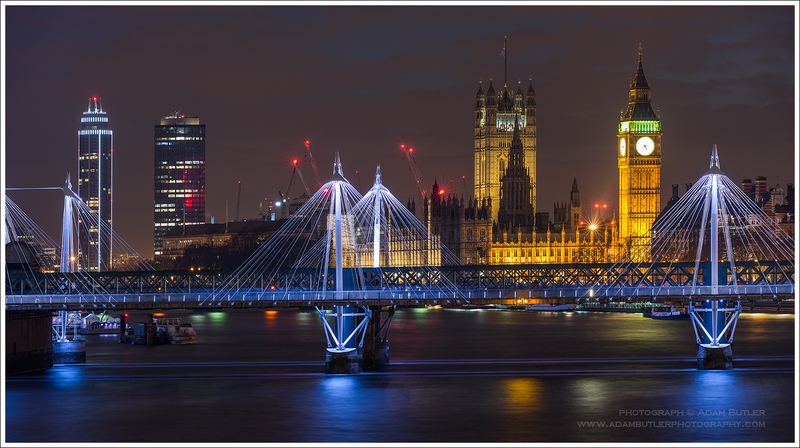 Adam has been photographing views of London for many years, and this is a unique opportunity to come with him on a walk along the River Thames in the evening* and to capture the marvellous views of the skyscrapers and bridges. The photographs of London by Adam Butler are in numerous private and corporate collections, they adorn the reception rooms and hallways of small offices as well as the boardrooms of multinational corporations and local government offices, and in this course you will learn how to go about capturing with stunning results the fabulous views of this magnificent city. The course includes a walk along the river with ample opportunity to photograph at various places, as well as a stop at the end in a quiet pub or bar to warm up and to review and process some of the resulting images on Adam’s laptop. This course will be held from 6:30pm until 9:30pm in small groups, and the cost is £50.00 per person. *In summer months, the evenings will be photographing at sunset and just after, whereas in the winter months the evenings will be mostly night-time photography. DSLR or compact camera with manual mode. Zoom lens, or interchangeable lenses, from wide angle to telephoto focal lengths. A shutter release cable is recommended, but not compulsory! This course is purely practical, and Adam will work with you as a photographic guide and expert in photographing London, helping you improve your techniques and to take better pictures of the London scenery and cityscapes. It is recommended also to be taken in conjunction with the Landscapes and Cityscapes Course which Adam also offers, in order to benefit fully from this course.